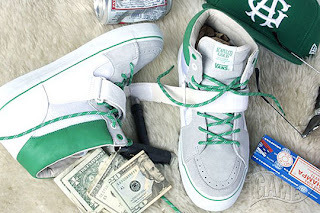 Acapulco Gold and Vans join forces to create the Moda Hi. Its a fusion of two older Vans models, the Sk8-Hi and the Mountain Edition. Taking a closer look at the shoe reveals that its as solid as fresh dollar bills, color and construction wise. 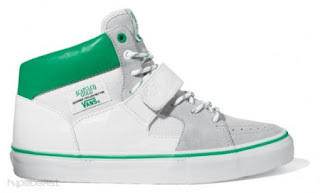 Features include an upper made out of suede/green leather/mesh and a vulcanized midsole. A midfoot strap adds extra stability to the shoe. Unfortunately the Acapulco Gold x Vans Moda Hi wont be available until March 2010, but is a sneaker we are looking forward to.